Hey guys! Here’s one of my go-to recipes that I eat almost once a week – my Quick and Easy Dill Roasted Salmon Recipe. I love that I need only three ingredients and that it’s ready in 15 minutes or less. It’s perfect for your busy weeknights when you don’t feel like putting a lot of effort into your dinner. But you still want to eat something healthy and delicious. 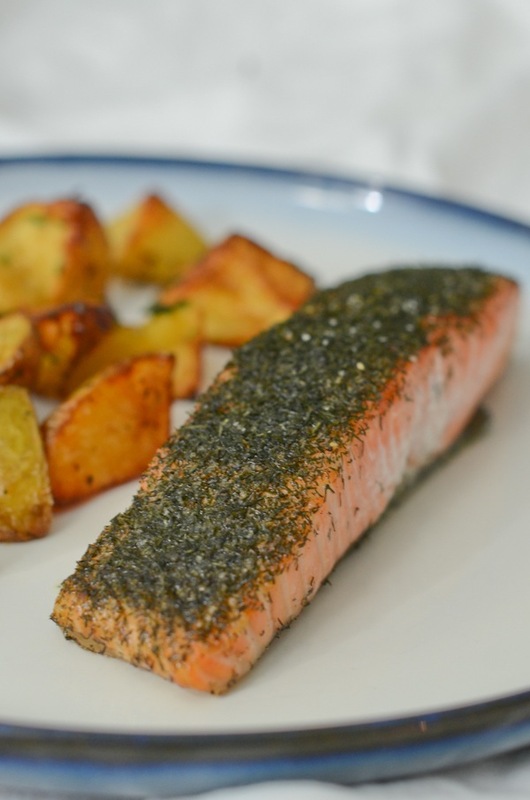 As promised, I’ve re-photographed and re-written the recipe for my dill-roasted salmon. The first time I did it, I used the flatter part of the salmon. But I’ve gotten to know my local fishmonger, and he said the thicker end is the better part. So, it’s what I order now, and I thought it would be go to represent this in the recipe. I took a short snippet of me preparing this in my first-ever What I Ate Wednesday video if you want to a little clip of this being prepped. You can see just how easy this is. And why you don’t really need to measure anything. Another bonus of this recipe. And I love that you can make this with pantry ingredients. Besides the salmon, of course. Pre-heat oven to 375 degrees F. Line a baking sheet with parchment paper. Add salmon, skin side down, to the prepared baking sheet. Sprinkle salt, pepper, and a light amount of garlic powder (or more, if desired) on top of the salmon. Cover the top of the salmon with a nice amount of dill. Bake 10 minutes per inch thickness of salmon, or until salmon is cooked to your liking. If you want some extra zest, serve the salmon with a wedge of fresh lemon and squeeze it on top before enjoying. Note: As I mentioned in my What I Ate Wednesday video, I don’t really measure the spices on top of this salmon. I use the amount needed for the size of the salmon I get from the grocery store. You may want to experiment with different amounts until you nail it. I find the dill is pretty light in flavor, so I add way more than it looks like I actually need.